Ice cream is good. And it’s not that hard to make. I was inspired to make the leap and buy an ice cream maker after an evening at Kevin and Mati’s apartment in Montreal. Kevin had made some delicious kiwi ginger sorbet and orange basil granita.Amber and I ordered a Cuisinart ICE-20 online through Zellers. A few days later, when we went to pick it up, I already had the ingredients to my first batch of maple walnut ice cream: Milk, Cream, Sugar, Eggs, Maple Syrup, Corn Syrup, Walnuts. The recipe I used is from the Ben & Jerry’s ice cream recipe book. This is a short video of my first experience making ice cream (thanks to April for filming. Since then I’ve made dozens of ice creams, sorbets, and frozen yoghourts. Here I am with my ice cream maker mentor, Kevin. 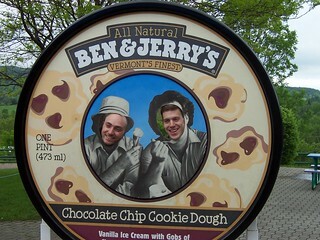 We toured the Ben & Jerry’s factory in Vermont together with a bunch of friends in the spring of 2004.